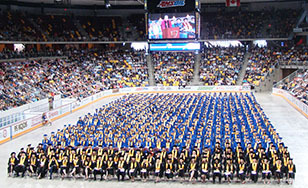 The Spring 2017 graduates lined up in the Amsoil Arena. Congratulations to all of our newest graduates! Commencement ceremonies for the Class of 2017 were held Saturday at Amsoil Arena. There were 897 total candidates for graduation, including 586 undergraduates and 311 graduate students. The commencement address was provided by The Honorable Patrick J. Schiltz '81, a United States District Judge, District of Minnesota. The Duluth News Tribune covered the speech. The student address was provided by Corey Bardon, 2017 Leadership Award Recipient and candidate for graduation. The St. Paul Pioneer Press published a heartwarming story about inspiring HIM graduate Gladys Reyes, and KBJR-TV Channel 6 interviewed psychology major Annalisa Dietz, who landed an adaptive sports internship this summer in Colorado after becoming involved with Outdoor Pursuit. Additional TV news coverage was provided by WDIO-TV Channel 10 and FOX-TV Channel 21. Here is a photo album of some highlights of the day. Once again, congratulations to all of our graduates and their families.